Evanston’s five mayoral candidates share various parts of their platforms at a debate held Monday night. The candidates discussed police procedure and town-gown relations. Evanston mayoral candidates reaffirmed the city’s commitment to being a sanctuary city and discussed racial bias in policing at a debate Tuesday night. 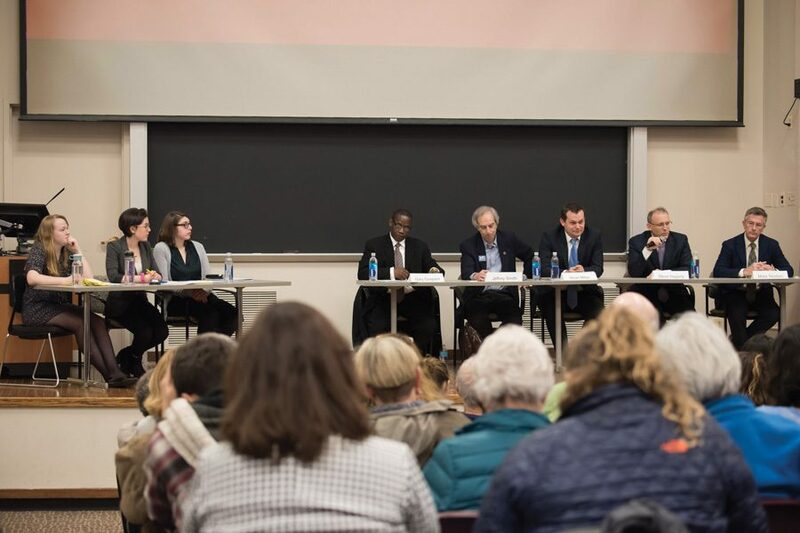 The candidates discussed town-gown relations, police policy changes and how to connect with the student body at the debate hosted by the Northwestern University Political Union and The Daily Northwestern. The five candidates — Steve Hagerty, Ald. Brian Miller (9th), Ald. Mark Tendam (6th), Gary Gaspard and Jeff Smith (Weinberg ‘77) — are vying to take over the position from current mayor Elizabeth Tisdahl, who is not running for reelection. Miller, who called for the release of Northwestern graduate student Lawrence Crosby’s arrest video in January, said he believed the circumstances of Crosby’s arrest were racially biased. In the video, Crosby was pulled over, tackled and punched by officers responding to the reported theft of a car that turned out to be his own. Miller emphasized the importance of having hard conversations and said he’s an “independent voice” on the city council. Smith said while he believes there is racial bias in society that extends throughout police forces, he said he was not willing to look at a particular case and claim it was a result of racial bias. “Statistically, the EPD does a better job, in terms of both who they stop and the amount of complaints they get, than your average police force,” Smith said. Still, Smith said EPD police officers should be out in the community more to better engage with the community. When questioned about the federal government’s resolve to pull funding from sanctuary cities, all candidates agreed they would uphold the “welcoming city” ordinance if elected mayor. Gaspard, who briefly lived in the country on an expired visa after immigrating from Haiti, affirmed his commitment to protecting undocumented immigrants. The candidates also discussed improving town-gown relations. Tendam, the city’s first openly gay alderman, said he already has met with two leaders in the Northwestern LGBTQ community and would continue to work with them. He said one of the main things the mayor has to do is get to know the students. Hagerty said he would like to speak to new students during freshman orientation week to give them an understanding of Evanston. He said he would support student causes as mayor. Smith encouraged student turnout for the election, which has been low in the past. The margin is often slim enough that a large block of student voters could significantly influence the election. Early voting for the mayoral election begins Feb 13., and the formal Election Day for the primary is Feb. 28. If one candidate receives 51 percent of the primary vote, they will win the election outright. Otherwise the top two primary vote-getters will face a runoff on April 4 to decide the position. Correction: A previous version of this story misstated the day the debate was held. The debate was on a Tuesday. The Daily regrets the error.